Are you about to graduate from an Ayurvedic program and feel the need for continued support as you create your own practice? Are you an Ayurvedic practitioner who's been on your own and wishes there was more support and community to engage with? This mentorship is for you! A maximum of 10 students in any one group. Four month commitment. -Once a month a 2 hour phone or Skype call including a lesson from Jennifer Ayres and time to give and receive support for your specific circumstances. 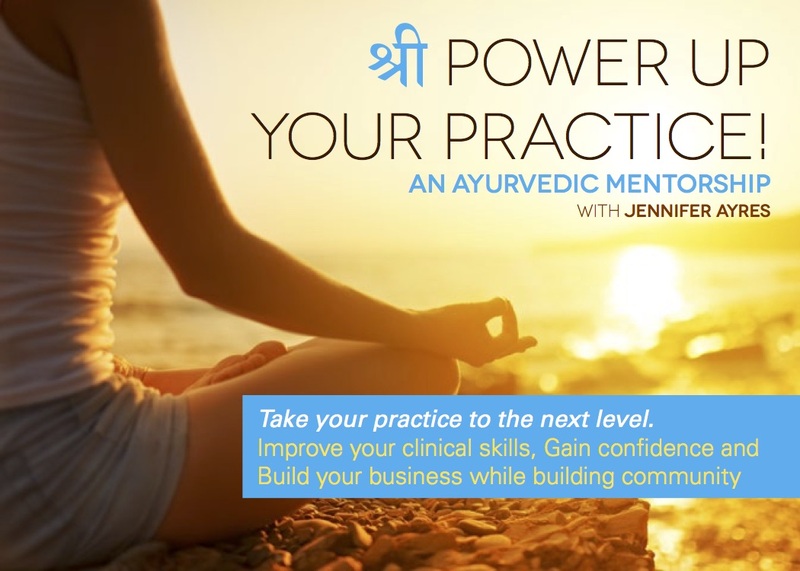 -Once a month a 2 hour phone call (or 2 one hour calls) one on one with Jennifer Ayres to receive support around specific cases, to clarify Ayurvedic theory, or any other topic needed. An email poll among members will decide the first meeting. During the first meeting the members will decide the dates and times of the remainder group meetings and one on one meetings will be arranged independently with Jennifer. This is a commitment of 4 months. No partial participation is allowed in order to build a safe container of community. Discussions will be determined by the needs of the group members. How do we align with our purpose in order to drive our business from that rooted place? ​How to follow the prana of your client to uncover specific imbalances, root cause of imbalance, and best method of treatment. How to clinically assess samprapti, specific disease process, dosha/dhatu/agni/gati/marga dusthi involved; create a safe and effective protocol including herbal formulas; and interact with the client in the best way to foster trust and compliance. Must have successfully completed at least one year of an established Ayurvedic program and be comfortable with the basic concepts of dhatus, srotamsi, samprapti, vyadhi marga, gati, etc. Must also have competency discussing basic anatomy and physiology from the Ayurvedic program or other programs such as massage therapy, biomedical science program, etc. Must have all requirements stated above as well as successfully completed at least 1000 hrs program AND have one year experience as an independent practitioner outside your academic program. $200/month for 4 months or $700 if paid in full before the first scheduled class meeting. Monthly payments are due the first of each month the classes are occurring within. Participation is dependent upon timely payment. Payments can be made though paypal: willowleaf@hotmail.com; following link below; OR email your choice of payment and receive an invoice to pay by following the links through Square. If cost stops you from participating please write to willowleaf@hotmail.com to apply for financial aid. Email willowleaf@hotmail.com to receive a registration form. Next Round Starting June 2018! !